Sometimes You Have To Do What You Have To Do…. Sometimes in business you have to do what you have to do…. And I don’t mean doing unethical or illegal things. I mean doing what you have to do. If you do not do what you have to do when you have to do it, then you miss the boat. While you’re kissing babies the train leaves. And you’re left holding the baby. Holding a baby won’t put food on your plate. Sometimes you need to let the baby go. To have the things you don’t have now, but you want, then sometimes you need to stretch into the uncomfortable zone. If everything in life came from a position of comfort, then everybody would have everything they want. Those who have more have made the tough decisions. They’ve chosen to go without now, so they can have more later on. They’ve chosen to do the hard yards now, so that they can have a more relaxed way of life later down the track. If everything that we want was easy to acquire, then we’d all have what we need. But we don’t have it? When you know what you want, with laser FOCUS, you will go and get it. Greed without action is selfish. Greed with action…. well that’s acquisition. If you know what you want go and get it. But don’t think that just because you do not know, that that entitles you to burst other people’s balloons. I’ve seen too many people give up on their goals for no other reason than the fact that giving up is easier. And when they give up, they try to make everyone else who does not give up feel bad for continuing their mission. There will always be those who rain on your parade…. because they have no parade of their own. Break free from these miserable souls. Let them have their pity parties. I will also be holding my celebrated one day workshop in Melbourne in June and in Auckland New Zealand in July. You can reserve your seats for Melbourne here. You can reserve your seats for Auckland New Zealand here. I was out to dinner with friends last week and as usually is the way the subject turned towards service. Or more importantly in this case lack thereof. We were a group of seven. And we’d asked for a table outside on the verandah. And as there were none immediately available for us we decided to wait rather than dine indoors. And so what happened was that the wait for the table seemed to be taking a while…..
And this wait seemed to disappoint some of my friends, who had been to this restaurant before. To me the wait time wasn’t a bother. I was happy sitting and chatting. It had been some time since I’d seen some of these friends, and so sitting and “visiting” suited me quite easily. What did concern me though was that our group was “parked” on a lounge, and no beverages and refreshments apart from water were offered. Which to me was a customer service fail. You see, to me, when I’m looking at how to run a restaurant, this is the easy part. As a patron, so long as my glass is half full, I’d not really be concerned about the delay to eat. And I’ve seen this sort of situation managed beautifully before at other restaurants. A good drink, and good friends, and I’m at peace. But my friends felt abandoned. You see, there was little or no schmoozing or concierging going on for our group. Nobody from the restaurant came to offer us adult beverages. And nobody from the restaurant seemed to want to come and update us on the progress of our table. Nobody brought us any snacks to nibble on while we waited for our table. To me it seemed as though the restaurant just did not have enough wait staff working to have someone available to make our party feel welcomed in their establishment. And in dental we can be guilty of this same thing. Because dental patients are usually likely to be spending hundreds and sometimes thousands of dollars at a time, we should be concierging them with care and attention. We should not just parking them in some “waiting room” or holding bay until its time for us to be treating them. For only a few dollars an hour, we can employ an extra person to fill the role of concierge at our office, attending to our patients, feeding and juicing them, making them a herbal tea or a skinny cap, or just plain spending some time and visiting with them, in the lounge. Not hiding behind some high upstand counter or computer monitor. Visiting with the arriving patient rather than parking them allows us to maintain the patients emotional status a whole lot better than if we abandon them into some waiting room. Because we all know, just like in retail, when we’re waiting and unattended we tend to let our minds wander. And wander into the negative. Whereas the client that we attend to is the client that we distract from these thoughts. When we are attending to the waiting patient rather than abandoning them and parking them, we’re actually activating two of Cialdini’s Principles of Influence. Firstly there’s the Principle of Liking. The patient feels liked, and in so feeling, they also like back. They like the fact that you like them. And they like your Dental Office. More than if they’re just parked. The second Principle we put into action is the Principle of Reciprocity. The patient feels that if you are giving them time, and attention, and beverages and food, then they can feel a need to reciprocate that attention. And that reciprocation may be that they feel more comfortable with accepting our treatment suggestions. More accepting than if they’d been left like a shag on a rock to simply just sit there and wait. While we waited for our table at our restaurant, one of my friends made the comment that where she buys her shoes, there always seems to be a long line of women, shoes in hand, waiting to pay for their shoes they want to purchase. And my friend feels a frustration with his sort of situation. Because although there is always a line of willing paying customers, my friend observes that there are usually only three cashiers working to process the payments, despite there being ten available registers. My friend and I discussed how many organisations out there feel that keeping the paying customer waiting is acceptable business practice. Because my friend felt that on one recent occasion, if she’d not been lined up with her daughter, she’d have simply dropped the shoes and walked out, and gone down the road to a different store where the service is known to be better. And the shoes aren’t that much more expensive. I reminded my friend that in Dentistry, we often see the shoe line at our front office reception each hour. Multiple dentists, multiple hygienists, all completing patients on the hour…. This means multiple patients coming out, and often there’s a line up of patients to sign, pay and schedule. And in just the same way that my shoe shopping friend had a disconnect at the shoe store, our Dental Patients are disconnecting when we make them have to wait to pay for our dental services. And in exactly the same way as when we park them in the waiting room, we also seem to be parking them in a line at our check out. And that just makes for another opportunity to disconnect. Again, for a few dollars an hour we can employ extra staff to eliminate the lines at our checkouts and stop our valued patients, about to give us hundreds and maybe thousands, from being disconnected. Am I making some sense here? You see, there’ll always be opportunities for our patients to mentally disconnect from our practice. It’s our role to reduce the number of those opportunities. The fewer times we leave our patients to their own devices, the more we stay connected to them, and them to us. Are you abandoning your patients? You see, you can be the best dentist with the gentlest pair of hands ever. But if you’re disconnecting from your clients when you need to be connecting, it doesn’t matter squat how great your margins are or how beautiful your flaps are or how many lasers and Cad-cams you own..
And our patients spell “Dentistry” exactly the same way. So stop parking your patients. Start spending time with them. Do You Have A Dental Crystal Ball? I had a call from a colleague yesterday about selling his practice. He’d been using an agent to find a buyer for his dental office. And the agent had come back to my friend with an “offer” from one of the corporates. Now as you know, I sold my practice in 2007 to a Dental Rollup. And the offer was exemplary. I received eighty percent of the sale price in cash, and the remaining twenty percent of the sale price was paper, in a company that we all thought would never fly. And so we thought we’d get our practices back in a fire sale. What happened was that when a third entity bought the rollup lock, stock and barrel, the paper matured to be worth almost as much in value as the cash component. On top of this, in the seven years that I worked for these entities I was paid far better than I ever paid myself while I owned my practice. And things are very different now. Then, in Australia, the corporates were kind of feeling their way. Eight and a half years on, now the corporates are starting to dominate the market. But, as a friend of mine said recently, the corporates wouldn’t be out there buying up dental practices if dentistry was not a profitable business. And I know, in my own story, once I sold, it was my duty to return to my purchasers a twenty percent profit each year. Knowing this, I’d say that owning a Dental Office is a very good business, and an even better business to own as a Dentist Owner. You see, no matter what the business, be it lawn mowing, hairdressing, nails, restaurants, whatever, there will always be customers who will be more than happy to pay for your service no matter what your fee is, without even caring what your competitors charge because they consider the service they receive from you to be exceptional value and they have no reason to question otherwise. The guy who mows my lawn every fortnight does an exceptional job and with such care and pride in his work that there’s no reason to look around for someone else. And although I could probably find someone else to do the job for twenty dollars less a time, I don’t need to go looking because I know that my guy is always doing a great job. And so even in dentistry, there will always exist that same twenty to thirty percent of the population who will be loyal to their dentist no matter what the dentist charges because they are comfortable with the service and consider it to be exceptional value. So back to my friend. A colleague of mine asked me when I sold to the Rollup why I had done it. He said the sale price was 4.5 times earnings, and in five years you pay them back five times earnings. So he said, in five years time you’ve paid them back the purchase price, and in the end, they’ve got your practice. And sure that’s a simplistic way of looking at things, and tax scales and tax breaks add other considerations. But for my friend, there’s the question of what is he going to do in five years time? With an oversupply of dentists thanks to government intake from overseas as well as more university graduates, the employment landscape could be vastly different in five years time. I told my friend that there is a security in owning your own unencumbered dental practice. My upcoming in depth two day workshops will be held in Manhattan in April as well as in London in August. What Feeling Are You Conveying To Your Customer? One of the pleasures of being a customer is receiving great service. Service where nothing seems to be a bother. Where the server goes about their business for the customer as if everything they do is an absolute pleasure. Have you ever had this kind of service? How does it make you feel when you receive this kind of attention? On the flip side, how upsetting is it to receive bad service? Service where you are made to feel like an interruption to the server’s day? Service where you are made to feel awkward, or unwelcome? Where you are made to feel stupid for asking your question? Which sort of service do you feel like you are receiving more of in this day and age? Sadly, the art of being a great server is diminishing. But with that diminution there exists great opportunity. With fewer and fewer organisations out there providing service of a world-class standard, it is now much easier for you and your business to “rise above the crowd” and truly stand out as being exceptionally different. How are things in your Dental Office? When the phone rings, do your team members treat that ringing phone as an interruption, or as an opportunity? Is it treated as an unwelcome interruption to the task at hand? Or does your Dental Office see the ringing phone as an opportunity to be of service to a person in need? When someone arrives at your dental reception are they welcomed warmly and immediately by the receptionist, or do they stand there, waiting, sometimes for an inordinate amount of time, as if they are invisible? Until the receptionist gets to a point where they are satisfied that it is now OK for them to be interrupted? Can your Dental Front Office people manage to multitask and speak on the phone, look at the computer monitor AND welcome an arriving person all at the same time? Rather than a look up and down of distain? After all, there’s a reasonable chance that the arriving customer wants to purchase something. And so they would expect to be greeted warmly. In the same way then we would expect that someone arriving at our Dental Reception could well be just about to pay our practice for some dental services? And why then shouldn’t they be greeted warmly? The Dental Reception is often *MORE* the face of the Dental Practice than the Dentist is. Sure the Dentist needs to be gentle, friendly, and technically competent, but when he’s appearing upside down and wearing a mask, it’s somewhat less personable. Whereas the interactions at the front office, both upon arrival and also upon the departure of the patient, are critical in determining the enjoyment and the experience, that the patient has that day. Nobody likes to feel taken for granted. And nobody likes to be hurried along. And nobody likes to be ignored. Is there anyone in your Dental Office conveying these feelings to your valued patients? Are your patients being brushed? Are your patients sometimes feeling that they are an interruption sometimes? Are your patients being “parked” in your waiting room? Brushing, hurrying, and parking do not fall under the category of world-class service. What really is going on at your office? Is everything your employees do an absolute pleasure? And is this the feeling they are sharing with your customers and patients? My recent visit to the Barossa Valley last month got me thinking. The Barossa Valley is one of Australia’s Premier wine locations. As my wife and I drove around the region from Cellar Door to Cellar Door, from winery to winery, from restaurant to restaurant and from town to town, we marveled at the expanse and the diversity of vines in the valley. There were paddocks of land ready to be planted. There were other paddocks that looked as though the vines had been there for thousands of years. Why did it look like some fields of vines would go on forever? And why did other fields look as though their old vines were being replaced? My subsequent research of the region’s wine making history showed that over the past seventy years, the region experienced some interesting periods of boom and bust and reinvention, as a result of world markets’ appreciations and not of various wine styles, types and flavours. Along with supply and demand and oversupply issues. Government attention, direction and intervention also helped to formulate the journey of the Barossa wine industry. At our visit to Elderton cellar door we were told how the family of the current owners of the vineyard had purchased the house, and the vines were “thrown in for free”. Truly the history of various wine makers in the Barossa tells many tales of experimentation, and business restructuring and redirection. In the business of dentistry we also need to reassess our direction and our business structures. Occasionally we need to remove those old vines that are no longer producing, and replant with different varietals that show more promise for the future. Sometimes the old vines, and old ways just aren’t cutting it for us any more. Sometimes it takes a light bulb moment to see with clarity the need to make those significant decisions. Rather than to wait and be affected, we sometimes need to be ahead of the wave…. There are aspects of dentistry that cause us to wonder whether we need to plant new vines. Do we need to start placing our own implants? Do we need to start doing our own bone grafting? Where is dentistry trending to? Are dentists to become the new sleep physicians and authorities on OSA? Are dentists of the future going to be the primary administrators of dermal fillers and facial enhancements? And what about the structure of your business? 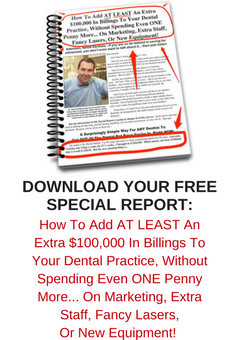 Some big dental practices look busy from an outside view but aren’t nearly as profitable as those with fewer providers that operate more efficiently. But was his practice profitable? Was that practice gliding through its areas of economic concern with confidence? Or was that practice just thrashing around? A good accounting programme will let you know whether your practice is operating with high knife-edge expenses and low margins. Sometimes a practice can be seeing large income coming in one door and straight out another door without hardly even “touching the sides”. Working hard and having a business purely so you can pay for expensive machines and premises and fit-outs isn’t always a great business decision. Sometimes there comes a time where we need to take a tractor to our old vines, because they’ve become a burden for our business. Sometimes we need to step back and re-assess. Is the old way still the best way? If the old grapes are causing you anguish, it might be time for a rethink?